I admit that my choice of desserts for my Fourth of July menu was a bit odd. (Yes, this post is several days overdue.) The rest of the menu was more or less standard fare: spicy buttered corn, pesto potato salad with green beans, and herbed grilled chicken. But the dessert... well, let's just say that the the humor in using a British dessert to celebrate the date associated with American's asserting their independence from Britain is not lost on me. 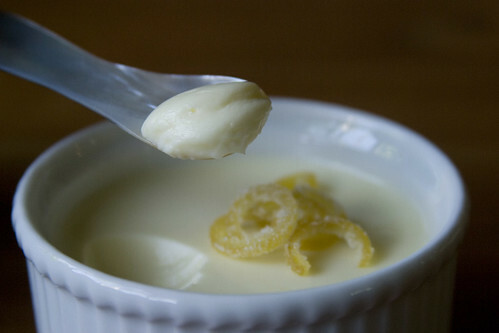 Originally I chose a posset for its simplicity: it requires only a few ingredients, is quickly prepared, and is best made ahead of time. Since I had three other dishes to prepare that afternoon, an easy make-ahead dish suited me perfectly. I was also just back from my trip to Scotland, where my meal at The Dogs* had first introduced me to possets. They are--for those who, like I was, are unfamiliar with them--simply cream, sugar, and acid (typically lemon juice) boiled together, and divided into individual dishes, and chilled until set. They are delightful and, despite the richness of the cream, wonderfully refreshing on a warm afternoon. Of course, since they are so very rich--not to mention because they're very little more than cream and sugar, so you're getting some serious bang for every bite--they are best served in small portions, and petite dishes such as ramekins come in handy. They take adornment well, from the light (a bit of lemon zest, freshly grated or candied) to the more substantial (a berry compote, for example), but you can also just enjoy them in their plain, perfect glory. Recipe below. Combine the cream and sugar in a small saucepan and bring to a boil over medium-high heat. Stir to encourage the sugar to dissolve. Boil the mixture for 3 minutes, stirring constantly and being careful to avoid boil-overs. Remove the pan from the heat, and stir in the lemon juice. Allow the mixture to cool for 10 minutes. When it has cooled, stir it again and divide it evenly among six ramekins or other small, individual serving dishes. Cover the cups and chill until the possets set, at least 4 hours or overnight. Garnish as desired and serve chilled. Yes, I think so. Certainly for lime. 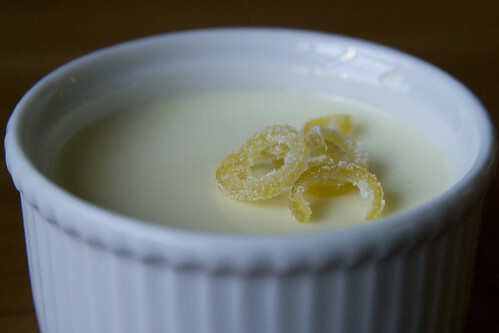 If making an orange posset you might want to keep some of the lemon juice for acidity, but I have seen one recipe that only calls for orange juice, so you might be okay with 100% orange juice.